Our second stop in Mexico was the island of Cozumel. We were up early again and off to find our shore excursion group. We had booked a beach buggy/snorkeling trip. There was a bit of worry about who we would partner up with as the buggies were 4 seaters, but we found a couple of like age who didn't wish to drive. Bruce drove the whole way. In MEXICO! And we lived! It was a fun zippy drive down the coast at break-neck speed. (we had to follow our leader). The only drawback was that Bruce didn't get to see as much of the countryside. The snorkel location was changed from Punta Sur to Chan- kanaab. We didn't know what this meant, but it worked out fine. The seas were very big when we got to Punta Sur, but here on this side of the island, all was calm. There was a short orientation on the beach where we discovered that we were with a group of newbies. Our tour guides, Arturo and Santiago wanted us all to wear these nice little life vests. Now this was fine, even a good thing, for the rest of the "school" of little fishies. But I'd rather die than strap that thing on. And would probably drown for it too. Thanks to my powers of persuasion, I talked our way out of that. Bruce and I were the last into the water and took off like fishes ourselves. I think the tour guide hovered near us for a while but soon left us alone. We had a great time swimming unda da sea! The visibility was very good except for one spot we found that had that funny water that told you there was a fresh water spring nearby. We had some very friendly (and would be photogenic) fish hanging out with us. I love it when they think we're a school. I hate it when they try to steal my thunder! Until we found this little guy. I don't remember ever seeing a ray this color. He was just doing his thing. I wouldn't have even seen him if he hadn't left the safety of the sandy bottom for a bit. Bruce used this opportunity to get some exercise in. He swam and swam. I had some trouble clearing my ears but he didn't seem to share it. He's a fish! And speaking of fish... does this look like a fish story to you? I don't know, but I don't speak bubble. I was worried at the start that the water would be too cold for snorkeling at 9:30 am. Not so. All too soon, it was time to get out. I wasn't even cold yet! I love faux summer! After a quick freshwater rinse, we packed our gear and trekked back to the buggies. We had a couple of photo ops on the way. This park is loaded with iguana of all sizes. We thought that was a big one until we found this guy sunning himself on a rock near the lagoon. There were beautiful tropical flowers everywhere as well. I caught this little hummer trying to get a bite. We piled into the beach buggies again and set out following our leader. I got the organic blow dry! Hey! People pay a lot of money for this kind of thing in California! But then they pay a lot of money to have their hair fixed again... this puts "boat hair" to shame. I was completely dry by the time we reached our next stop.... Caracol ruin. this small Mayan ruin was once a sort of smoke signal lighthouse at Punta Sur. It also would sound a horn-like warning when the winds of a hurricane got too high. How do they know these things I wonder? There was also a lookout tower in a swamp full of gators. We walked down a rustic boardwalk into the swamp where we found these roseate spoonbills (I was hoping for flamingos) who didn't seem at all worried about the alligators. The alligators didn't seem too concerned about the human spectators either. Maybe it's siesta! We walked right up over this female and listened to our tour guide giving us "alligator 101". Did you know that they only need to eat every 1 to 3 months? No wonder the spoonbills weren't worried. We climbed up to the top of the lookout tower to get the full effect. From up there, we could see the alligator in the center and another one off to the right. There was also another one, a BIG one off in the distance that we never would have seen had he not moved. The view from up there was spectacular and you could see the lighthouse that would be our final destination, in the distance. We left the swamp and resumed our drive along the coast. The air was heavy with humidity and the smell of honey. I was soaking it up. It was such a heavenly smell. It made me long to cruise again. What is that SMELL?! There were iguana everywhere here too. They dart out into the road. We saw only one that didn't make it. Quick little devils! It was warm and dusty and we were covered with white powder by the time we got to our next stop. This was to be the lunch stop. We were taken to a beach palapa, a GIANT beach palapa for a quick authentic Mexican lunch. Now I would say that this was the worst meal we had on this trip. But oh well, the ambiance more than made up for it. We spent a pleasant half hour or so lazing on a beautiful, near deserted beach in the warm sun. Give me a chair on the white coral sands and I'll be happy forever! These are the moments I hold in my head to think about when I'm stressed. Just close my eyes and see my toes covered in sand with the blue waters in the distance... stress gone! We were roused from our daydreams by our tour guide telling us we must move on. Back into the buggies and off to the final stop. Another "break-neck" jaunt to the end of Punta Sur. this area is nearly deserted. The lovely beach along the way is a reserve where turtles nest, and so is not open to the public. We reached the end and gathered around the base of the lighthouse for a talk and to sign the waivers to be allowed to go up the 123 steps to the top. I guess this means that they have lawyers in Mexico too. We are not afraid, we're going to the top! The inside of the lighthouse consisted of plain spiral steps with cement walls. It was dizzying to climb the seemingly endless steps punctuated only by the occasional window. We looked out each one to check our progress. The view at the top was well worth the protest our thighs would later launch. How can this shore be so beautiful and not belong to some rich guy? It's a shame that so few are enjoying it today. Bruce checked out the lense and mechanism inside and decided that it is a working lighthouse. It's got a giant lightbulb! We began the climb back down. It was a bit hair raising as I pictured myself taking a false step and tumbling to the bottom. But it was not so bad after all, except for the shaky thighs. At the end of our climb down, I asked Arturo what that wonderful honey smell was. He said it was the scrub all over the island. When I took a closer look, I found that there were tiny little flowers and that the bees were going nuts over them. For good reason! I can't believe that the volume of scent in the air came from those tiny flowers. We drove the buggies back to the Cruise Ship dock and parked ourselves at the Fat Tuesdays there to wait for time to board. Bruce had a cigar to smoke and I found a lovely and cheap Margarita. It wasn't long before we were joined by a bunch of the others from BYC. We had a blast while we compared excursions and played with the cigars. We all went back to the ship for naps before dressing for dinner. We had each brought a couple of bottles of wine aboard and had jet to drink them. 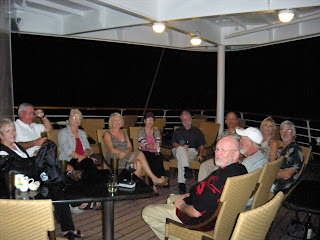 We arranged to meet on the fan tail deck for a wine tasting. You would think we would be growing tired of one another by this time, but not so. We laughed so hard I thought I was going to fall overboard. We had another great dinner and went to bed. Tomorrow would be a no stress day aboard the boat. Another "fun day at sea" Here is our surprise critter of the day. P.S. We hit a cold front in the early morning in the Gulf and the boat was really moving for several hours. We couldn't spend much time on the deck by the pool as we had planned so we made use of the time packing. The winds came down somewhat by afternoon which made for a less bumpy ride and everyone felt a bit better. However, there was some rain to contend with which again, kept us inside. The evening dinner was grand with a bit of nostalgia at it being our last. Afterwards there was a superb show in the Starlight Lounge. It began slow but gained momentum. The dancers were so energetic and I bet they changed costumes a dozen times. There was a pair of Russion dancers that did some incredible strength moves that had us all on the edge of our seats. It was a first class show! 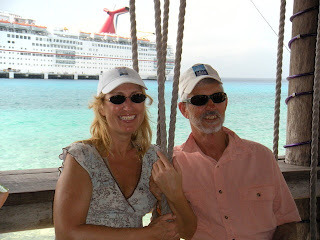 We all had a great time and Carnival Ecstasy more than exceeded our expectations. It was so cheap! We'll definately do it again. Like I said before, gotta stock the bar!